Since I can remember, I always wanted to study abroad as I come from an international background. I was born and raised in Colombia, with a Dutch father and an American mother. I wanted to study abroad in order to complement my knowledge, expand my horizons and encounter new people and cultures. International students from all over the world come to study in the Netherlands. In 2014/15, international students came from a total of 157 different countries, mostly from Germany, China, Belgium, Italy and Spain. Most Dutch universities have international student associations, which help students throughout their studies. The Netherlands is also a unique non-Anglophone country, where approximately 95% of locals speak English. This factor makes living, studying, and working in the Netherlands very convenient, comfortable and pleasant for international students. The Netherlands is also very open and tolerant, welcoming everyone to share their opinions and express themselves. This is very much encouraged during your studies. Studying in the Netherlands is not that expensive, compared with other English-speaking countries such as the UK or US. Dutch higher education is subsidized by the government and tuition fees are relatively low. With the country’s renowned standard of education and comparatively low cost of living, studying in the Netherlands will give you true value for money. 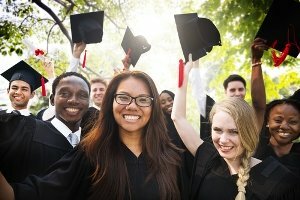 Annual tuition fees for a degree program or course at a Dutch higher education institution start at approximately €1,900 for EU students and €6,000 for non-EU students, depending on the institution. Further, if you decide to have a job alongside your studies, you can also declare these expenses, and get some money back from taxes. How cool is that? In addition, many Dutch universities offer grants and scholarships that can reduce or fully cover the tuition fees of study programs. The Dutch educational system is of high quality and Dutch universities are acknowledged worldwide for their well-designed, modern courses and facilities. The teaching style focuses on teamwork, which makes it easy for international students in the Netherlands to meet Dutch people as well as other international students. Dutch universities place a strong emphasis on good personal relations between professors and students. Most tutorials and seminars take place in small groups of around 15-30 students. Most of your coursework will consist of group work, developing not only your academic skills but also your ability to work together as part of a team. Dutch universities include many practical elements in their degree courses. There is a high emphasis on relevant practical experiences, and universities have a lot of partnerships with Dutch companies, as well as international ones. As well as general universities, there are also universities of applied sciences, which provide more specialized studies. For those who prefer to gain insights into practical issues, a university of applied sciences might be more attractive. These focus more on practical experiences and less on theoretical and research matters. Compared with other western European locations, the cost of living in the Netherlands is relatively low. From my own experience and from my friends’, you will need between €800 and €1,000 per month. To fund this, you can combine part-time jobs and study finance. If you are a EU student, you can work 32 hours a month and be eligible for a €265 grant and a student OV-Chipkaart for free public transportation either during the week or weekends. There are many useful websites for students to find student accommodation. I would advise you to start looking for accommodation early, because there is a huge demand. From my experience, if starting studies in September, the best months to start looking for accommodation are May, June and July. Definitely don’t wait until August, as you will end up either finding expensive or low quality rooms. As a student, you can also get discounts in many bars, restaurants, museums and cinemas. You can get around town easily on a bicycle. This is not only typically Dutch, but also a cheap means of transportation. You should definitely ask for an ISIC Student Card to get many more benefits and discounts. The Netherlands is known as the first non-English speaking country in which universities started to design higher education study programs in English, to attract students coming from abroad. More than 2,100 English-taught study programs and courses are available in the Netherlands, covering a broad range of fields, and leading to a bachelor’s, master’s, PhD, diploma or certificate. It certainly does sound great: high-quality, affordable education offered in many disciplines, in an international, open-minded country. However, Dutch universities do have strict language requirements if you come from a country where English is not the native language. As an international student you are required to take the TOEFL, IELTS or a similar English language test. You should check the university where you are planning to apply, for more details about their requirements. As I mentioned, the Netherlands is a very international country and very convenient as most people speak English. Nevertheless, I think it’s always valuable to take an introductory Dutch language course to at least pick up the basics, and many universities in the Netherlands offer Dutch languages courses for internationals. You can also use other online resources to find language courses, as well as new cool language apps and dictionaries to ease your stay in the Netherlands. The Netherlands is centrally located in Europe and is in easy reach of all major European cities. The Netherlands is often described as the “gateway to Europe”. It takes only about an hour to fly from Amsterdam to Paris, Berlin, Brussels, or London. It also has great connections and accessibility by train to all major European cities. The Netherlands also has a well-developed and connected transportation system, and various discounts for students make travelling quite affordable. As mentioned, when working 32 hours a month, you can also get a student OV-Chipkaart, which gives you access to free public transportation. This makes it very convenient and cheap to explore the whole country. Further, you will love how easy it is to get around with a bike – the preferred means of transportation of the Dutch, and also the cheapest. You can cycle in peace, confidence and tranquility, as there are dedicated roads for cyclists. The Netherlands has also been recognized as a knowledge center with rich study traditions and well-known universities. Scientific research at Dutch universities is very highly valued at both the national and international level. Education in the Netherlands meets all international standards and is well-reputed worldwide. A diploma from a Dutch university provides an opportunity to start one’s own business and can be very useful in terms of having a successful career in any country of the world. The most recognized universities in the Netherlands include the University of Amsterdam, Leiden University and Utrecht University. Personally I also recommend Maastricht University (where I am studying for my master’s degree); it is also highly accredited and has a very effective teaching method called project-based learning. This makes you study actively, participate, work in teams and focus on real-life problems. Amanda comes from an international background, born in Bogotá, Colombia, with a Dutch father and American mother. She has a strong passion for traveling, languages and horseback riding, and speaks English, Spanish and Dutch. Having completed a bachelor in business administration, she is currently studying a master's in strategic marketing in Maastricht, the Netherlands. I have recently graduated from a university in Wales in the UK and I was accepted to do my masters in European Law in the Netherlands. However, I also had the option to do both my masters and LPC in the University of Law in the UK. However, the masters in Netherlands- the course seems really good, but although here in the UK I will get an LPC and a masters, but I will have to do it in a field that I do not particularly enjoy. Hence, quite on the fence as to what I should do ? 2 in 1 in the UK ( LPC and Masters for one fees, but will not enjoy what I will master in) Or Netherlands, good master programme. Any suggestions please? I love this place and had a dream to study abroad. But circumstances dint prevail and had to study in India. Also m working in one of the finest Engineering company Although looking for some more opportunity. Thanks for the quick info. The article succeeded in developing interest for studying in Netherlands. I just want to ask few things. What's the scenario for VISA? How many months are we allowed to stay after finishing our Master degree ? Getting a Citizenship is easy there ? How about the placements for MS in CS students ? I currently hold a Bachelor degree in CS. And also carry an year of relevant work experience. I am done with my GRE and IELTS. Please help me out as I am looking for a country that can offer good education and after life. Also that my prime criteria is lowest possible tuition fees. Hi Tejas, please take a look at our guide to studying in the Netherlands, which contains information about how to get a student visa to study there and the other requirements. If you have an EU nationality, you do not need a permit to stay in the Netherlands to find work after you graduate. If you're from Croatia or a country outside the EEA, then you will be allowed to stay for a zoekjaar (search year) period to find employment. To find out about placements on Masters of Computer Science courses, I would advise you to check the course outlines on the official websites of the universities you're interested in. If you can't find this information, simply contact their admissions office - they may also be able to help if you have any more queries about seeking work in the Netherlands after you graduate. Here are the rankings for the top universities by subject for computer science, narrowed down by country to see the results in the Netherlands. Hope this helps!